Vivian Marie Aubin du Paris: Manga Monday! Price: EXPENSIVE! Mangas are usually $9.99 each book. But worth it? Yes. Description: What do you do when true love is just beyond your reach? Hey is a normal teenage girl who has a crush on the hot teen singer EZ. But whenever she tries to work up the nerve to confess her feeling toward him, EO always gets in the middle of things! Pop star EZ may never think of Hey as anything more than a fan...This is a charming romantic fantasy that shows you true love is where you least expect it! 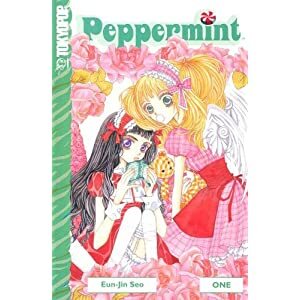 My thoughts: I LOVE this manga! Normally I don't love manhwa's, but I chose this one to start with for a reason. It's full of great romance between likable characters, and a love triangle that just keeps tugging at your heart strings. And for those of you who like a little bit of a twist in your romance, the second part of the triangle is younger than the main girl--by several years! He has an extreme phobia of girls, which Hey slowly seems to cure him of without even trying. She's a strong girl (except around her crush, when she blushes and stammers adorably!) and you keep rooting for her until the end.